The testing and production facilities at Peenemünde were almost completely destroyed by the bombings of August 17th, 1943. Shortly after this loss the plans were speeded up to produce the rockets in a bomb-proof environment. A suitable location was soon found: Geheimprojekt Mittelbau near Nordhausen, the onetime central oil depot of the German Reich. The same applied to required workers who were the prisoners of the concentration camp Buchenwald. As early as April 30th, 1942 the SS-Obergruppenführer and General of the Waffen-SS Pohl had announced a new policy: ‘‘Die Verwahrung von Häftlingen nur aus Sicherheits-, erzieherischen oder vorbeugenden Gründen allein steht nicht mehr im Vordergrund. Das Schwergewicht hat sich nach der wirtschaftlichen Seite hin verlagert. Die Mobilisierung aller Häftlings-arbeitskräfte zunächst für Kriegsaufgaben (Rüstungssteigerung) und später für Friedensaufgaben schiebt sich immer mehr in den Vordergrund’. The following starting points would be applied, as it was only about prisoners: ‘Die Arbeitszeit ist an keine Grenzen gebunden’ and ‘Alle Umstände, welche die Arbeitszeit verkürzen können (Mahlzeiten, Appelle u.a.) sind daher auf ein nicht mehr zu verdichtendes Mindestmass zu beschränken’20. In fact this meant deliberately: ‘destroying by labour’ (Vernichtung durch Arbeit). For political prisoners one used the expression: ’Night and Fog’ (Nacht und Nebel); they would disappear without a trace - into the night and into the fog. The full content of this policy was experienced by the prisoners arriving in August 1943 from Buchenwald. They had to build the bomb-proof tunnels in which the V2-factory could be housed. Thousands of political prisoners had to build the tunnels in 12-hour shifts under appalling conditions. This is what J. Verwijnen (ex Nacht und Nebel prisoner) remembers (in 2000). There was no accommodation; the prisoners had to eat and sleep on the premises midst noise and dust. The hygienic conditions were very poor. Not until October 1943 did they start building barracks, which were named Dora. Six months later 12.000 to 15.000 prisoners were accommodated here. In February 1945 the maximum of 41.766 prisoners was reached. In the Concentration camp Mittelbau 10.138 prisoners died according to the camp's administration21. .This administration was not complete nor was it kept up to date. For example: the names of people who died during the journey were not recorded. At this time experts presume the number of victims was twice as high: about 20.000. Dora was an underground factory with an area of approximately 300.000 square metres and consisted of two parallel running main tunnels 2 kilometres in length. The main tunnels were connected by side tunnels. One main tunnel contained the assembly line; in the side tunnels components were assembled and supplied to the assembly line in the main tunnel. The second main tunnel was used for supplying parts etc. The tunnel compound was partly used to build the Junkers aircraft engines [Nordwerke], and assembling V1s. The code name of the V2 factory was Mittelbau. Since the beginning of 1944 rockets were mass produced by prisoners. To build a complete V2 rocket one needed about 12.950 man-hours22. Using forced labour the costprice was only DM 38.000 per rocket. In comparison: the production of a V1 flying bomb [without the warhead] would take about 800 hours; the 7.5 cm anti tank gun Pak 40 cost DM 12.000 and took 2200 man-hours, while the cost of a 28 cm K5 (E) railway gun was DM 1.250.000 and for the production of the same weapon one needed 100.000 man-hours. The rocket consisted of a large number of high standard parts, manufactured in factories all over Europe, including some in the occupied nations23. For planning and quality control all parts had a factory code. For example: Ebb 7085 = Klein Schanzlin & Becker AG in Frankenthal, Pfalz. The same strict quality control was used concerning the labour of the prisoners. As since the summer more and more rockets were returned with a fault, the punishment by the SS became more and more severe. If one was caught or only suspected of sabotage, he was hung in front of all the men in the camp, as a deterrent. In the beginning this happened to about 10 men every month, but the number increased. So in March 1945 more than 180 prisoners were hung, mainly Russians; 30 of them on an iron beam in the main tunnel. Many unsuccessful launches in The Hague and nearby were probably caused by sabotaged rockets that had slipped through the quality control. It was not only the hard physical labour of constructing the tunnels and the infrastructure which caused so many victims: the assembly of the rockets was also hard work. The factory operated 24 hours a day, mainly in two shifts. The average working week of the prisoners was 70 hours. The majority of the prisoners employed for the production of the rockets were of East-European origin. Technically highly qualified prisoners from Western Europe, such as professors and engineers, were used to assemble the electronic parts. They were treated better than the others. 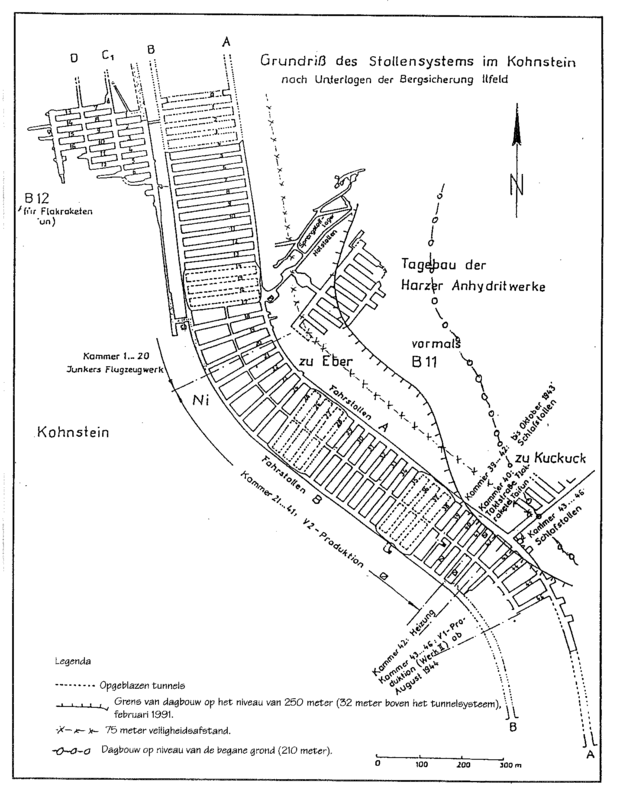 Around Buchenwald there were several satellite camps, providing accommodation to prisoners involved in the various production phases of the rockets. For example, the testing of the rocket engines took place in a nearby slate quarry. The prisoners were housed nearby in barracks called Konzentrationslager Aussenkommando Laura. They had to cope with the same inhuman working regime. Here too, many prisoners died of maltreatment, murder, accidents, illnesses, starvation, cold and exhaustion. Sept. 1st 1939-May 8th 1945. Ed. : International Tracing Service HQ. Arolsen, April 1950, 2 Vols.